Everyone who cares about students with disabilities is troubled by Arne Duncan’s latest NPR blathering over the Obama administration’s plans to get even tougher on special ed. and to test these students more and include their scores in the National Assessment for Education Progress known as the Nation’s Report Card. I have been trying to understand. I mean they can’t be that dense when it comes to kids with special needs. When they started the conversation by saying that 6.5 million students with disabilities weren’t getting a “quality education,” I thought, Hallelujah! They finally know that what they have been doing, like forcing students with developmental disabilities to take burdensome tests that are unrealistic, can be likened to child abuse. Do more than measure compliance? Making each student wear a ball and chain comes to mind. But what are they really getting at? Surely they have seen the outcries about high-stakes testing with these kids. Duncan, with support from Kevin Huffman, who is hanging onto his job in Tennessee by a slippery spaghetti noodle (honestly, how many petitions to remove him does it take? ), spoke out demanding even more accountability. Huffman believes, or so he says, that all students with disabilities, and they were talking about those with developmental disabilities too, should be made to comply through more homework. Both men insist students in special education pass the tests, because it does them a disservice not to. You can save yourself a bottle of aspirin trying to figure out how these two got to be such high-powered leaders in education without an ounce of understanding about students with special needs. Behind their dog and pony show there is a calculated reason behind all their bizarre test and homework talk. It is designed to fool us. The real reason for all their get tough talk is to rid the country of special education services. The fact is there has been a concerted effort for years to get rid of special education. It did not start with Arne Duncan and it probably won’t end with him either. Consider IDEA 1997 and IDEA 2004. Why did they come up with those reauthorizations? If you think throwing all kids into regular classes, in the name of inclusion, and curbing parental rights for legal representation is a gift, think again. Many of us realize that special education has been dying a slow death for a long time. See here about the destruction of special ed. Special ed. has always been a pain to local, state and federal cheapskate politicians. Since the creation of Public Law 94-142, one of the best laws ever, there have been detractors who have worked to undo all the progress that has been made on behalf of those with disabilities. To do special ed. right is costly. The sad fact is the ed. reformers know special ed. requires credentialed, well-prepared teachers and good programming and they don’t want to pay for it. Charter schools don’t know how to serve these children…or they don’t want to pay for it. And it is tough to implement good special education with Teach for America. You also can’t sell Common Core State Standards. Special education is a great indicator to show the importance of differences. You can’t put everyone on the same page, with any of the standards really, if students require an Individual Educational Plan. See here. The NPR show ends with Duncan speaking of a $50 million technical-assistance center for states concerning students with disabilities passing more difficult assessments. However, my guess is it isn’t about helping teachers help the students, no. It is about showing that teachers are failing when they can’t get these students to pass the regular tests. The next step will be their excuse to pull $11.5 billion in federal funding to states for special education! They are already targeting Delaware, California, Texas, and Washington DC. Then what will happen to students who need special ed. services? You tell me. My guess is we will see more charters claiming to be just for students with disabilities run by the TFA types. Wealthier parents might pay hefty prices for private schools, which, for the most part, have shown little proof of serving this population well, if at all. Poor students with disabilities? Where will they go for help? So are students with special needs doomed? I don’t think so. I’m remembering the court cases PARC v.Commonwealth of Pennsylvania and Mills v. Board of Education of the District of Columbia. There are other cases too. I am actually encouraged. 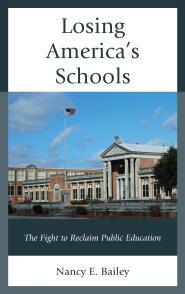 I see special education as the Achilles heel of the reform movement. Duncan and his ilk don’t know how to assist these kids, and parents find the “high expectations” talk shallow. What parent has low expectations for their child? What person becomes a teacher not to expect great things for their students? The real beauty of all this, the silver lining, is that parents of children with disabilities, while desiring the best quality education and assistance, have learned how to love their children unconditionally. They don’t need high test scores to show them their student’s worth. They see the beauty every day in the stuff of this world that really matters. There are a lot of these parents and they aren’t the silent types. And if it has been done before, it can be done again. We can fight for the rights of children. The ed. reformers know this. It is what they are afraid of. So, we must look beyond these outrageous acclamations by Duncan and his ilk and remember these words: Free Appropriate Public Education, or FAPE for short. Say it to yourself over and over again. It is what our students deserve…every single one of them. And it is our job to ensure that they get it. Thank you Nancy for your continued efforts to uncover and inform the public of the agenda. It can sometimes get overwhelming to hear how much the system and the controllers seem to be against us… I can only imagine in today’s climate the parents/families who have the added responsibility of taking care of a child who has special needs and being repeatedly manipulated and seemingly beaten by the system. One thought that came to mind is “It takes a village”. Being raised in a family with a special needs child I understand this. There were always Aunts. Uncles, Grandparents and cousins to help, to raise up, to laugh with and cry with and brainstorm. But there were also all the friends and the neighbors and truly the village that helped. It worked because my parents did know how to network, they did know how to open their own home and their own hearts. Everyday, if we look, sometimes we may have to dig a little, we will realize we still do have communities where people are willing to come out and help, where people if they are asked, want to make a difference, where there are many who are just waiting to reach out and help. There are stories of villages/communities all over the world coming together to make a difference. We can make the changes for the better, luckily we have people like you who help us see and possibly give us the courage ourselves to speak up, stand up, and find a way to help.. Thank you, Kara, for your kind words. The more support a family has for a student with special needs the better. And that support can come from a variety of places. I like the “takes a village” concept very much. It sounds like you had a lovely family situation. Thanks so much for sharing. Great post, Nancy! Duncan’s “accountability’ is really about dismantling IEP protections and provisions. I’m unclear how shifting a proportion of compliance from IEP’s to test-based scores will strengthen outcomes and guarantee full due process protections for students in SPED. In public schools all over the country, standardized test scores are being used to punish teachers, not to improve instruction. Children in SPED are becoming more segregated and excluded, rather than included, due to DoEd’s test score-based accountability. In TN, we have political leaders stating that they, I quote: “are not going to spend money on those [special education and at risk] kids.” [my words inserted are relevant to the context]. IDEA makes the IEP – not test scores- the decision point for placement, related services, testing, and due process. A child’s goals and objectives are the source for accountability. This new policy asserts that test scores are the primary determinant of progress, rather than individualized goals. Shifting the decision making power to test scores undermines the fundamental integrity of the IEP. CEC cannot participate in such a shift if we are to assure the school based IEP team maintains its contractual power. NAEP scores are helpful in comparing large groups of similarly situated children in controlled studies. NAEP is not designed to measure individual progress, and as such, should not have the weight of overseeing schools compliance on IEP goals and objectives. Standardized test scores alone cannot inform curriculum, staffing, targeted instructional procedures, specialized equipment, or paraprofessionals. This is the role of the IEP. Yet, DoEd will usurp these decisions if test scores become the goals they choose to enforce. This move by DoEd appears to be a backdoor for weakening IEP decision making powers by reducing the influence of the IEP team based decisions to test score-based decisions. I hope CEC resists any and all attempts to weaken IEP and due process for SPED students. We have come too far, for too long to permit this to happen. Thank you, Joan. Your comment really nails it! It is interesting that what is happening is exactly the opposite message they send. I feel like we are going backwards overall in education and particularly in special ed. and early education. The heavy push for accountability is terrible for children. Your points really complement my post today. I appreciate your feedback! Special education began due to the blood, sweat, tears, and litigation filed by parents of children with disabilities. This same grassroots effort will be required if oppressive, inappropriate assessment demands on our special education students are to be fended off. As a special educator and as a parent of children with disabilities (ADHD and mild autism), I will do all I can to call attention to this foolish notion that expectations of special education students are too low and that these learners are not deserving of resources needed to educate them. Thank you for being an ally in this struggle, Nancy! Thank you! I don’t know where “low expectations” came from. Of course there are a few teachers who don’t do a good job, like in any profession. But most teachers go into teaching wanting to lift students. Why be a teacher if that’s not what you want to do? The salary?! Special ed. is no different. One could argue the expectations there are even greater. I appreciate your comments. I think we are seeing some push back! I have earned National Board Certification in English. I received my PhD in Special Education in May 2013 and have decided to leave the profession. I cannot abide the nonsense that drives departments of education at any level. Test scores do not prove learning. How can any reasonable person administer a reading test to a student with dyslexia and expect results comparable to the AP students in the same class? Even more absurd to test students with intellectual disabilities. I am very sorry to hear that, Frances. I know you did a lot of work to earn the certification and especially the PhD. I understand your frustration, however. I hope you can find a way to use your skills and put your education to work. Thank you for your comment and believe me, I agree! I cautiously disagree with what is shared here. Students with disabilities (SWD) covers a wide range of needs and issues of students. The majority of SWD’s fall in the mild to moderate category and are not provided services that are appropriate to achieve their potential. Also, I find myself surrounded by parents who settle for low expectations for their child buying into the notion that their child is limited by their disability. I refused to buy that from my child’s educators and she is now entering high school and will take honors classes. One illustration of these low expectations was a 2011 study I reviewed in our area where only 2% of SWD’s took the SAT. Which was actually up from the same report in 2009 which was 0%. Speak of low expectations! Not even one SWD was seen as having the potential to attend a 4-yr college? I’m not ready to buy into a conspiracy theory just yet, let’s see some growth first. Hi Dave, Thank you for your post. I agree that there is a wide range of students with disabilities. I think we agree on services. For many years I was a resource teacher for students with learning disabilities. We never had anything but high expectations! But students who come to us, and I must emphasize that, they appear at the classroom door with cognitive difficulties, need help and remediation of those difficulties. Many of these students might do well in a regular class, especially if it is a reasonable size and they receive support, others will be lost. Our overall goal as teachers has always been to move students with disabilities forward. I cannot speak for the parents you describe. Some students with disabilities can progress well and take the SAT. Others need help to get to that point. The schools should provide support for all of those students. But many of these kids are now lost in oversized inclusion classes with no support..
Have you read about some of the students with developmental disabilities being forced to take tests? That is especially cruel.. I am delighted your daughter is doing so well! I think we both agree very much about services..
Great work, Nancy. I’m a long-time public education advocate in Seattle (and my son does have a disability but also graduated from college). 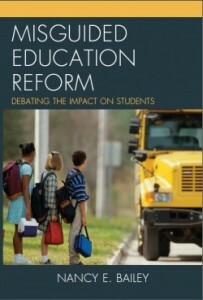 I’ve tracked ed reform for years and I believe you have hit the nail on the head. Sped IS one area reformers fear because they just don’t know how to box it up and get away with that. And, I think you are right that if enough cases get to court, parents will win every time. As for conspiracy theories, well, with the HUGE amount of evidence about Bill Gates and Common Core, the ability to track what Duncan says and does, charter school failures and inconsistencies, etc. – it’s no conspiracy theory. People just need to line the evidence up because it speaks for itself. Hi Melissa, Thanks for responding and also re-posting on your great website. I don’t like conspiracy theories either, but a lot of this stuff is unbelievable. I hope they start changing their objectives! Take care. And stay in touch! I am sitting here shaking my head in disbelief. I have students with IQs of approximately 15. I say approximately because they are so low functioning that they can not toilet themselves, yes the states have to “educate” them. So Obama and Duncan want these students to perform better on tests. They are already required to solve quadratic equations, and write 5 page essays based on reading passages. Don’t laugh. I am not exaggerating. We have had to put those tests in front of them, put the pencil in their hands and wipe the drool off as it would interfere with the Scantron…Really? Someone please tell me who is really the mentally disabled persons in this situation. I’m so happy to see these posts about the absurdity of having students with lower functioning levels be subjected to standardized testing! I join all of you in standing up to increase the public’s awareness of this issue. I have just retired after 39 1/2 years of teaching students with all levels of cognitive disabilities, with half of that time teaching students with severe disabilities. I started teaching in Pennsylvania a year before PL94-142 was implemented. It’s been an honor and a privilege to have worked with many families, and to know that I have done my best to provide creative, collaborative and INDIVIDUALIZED instruction which produced many, many “inch stones” (the equivalent of a general ed. student’s milestones!). PL94-142 inspired me to provide the education that my students’ parents had begged and fought for. I have such contempt for current politicians who are being manipulated by testing companies! I will continue to advocate in my retirement for the “appropriate” education these special students deserve. Yes, have high expectations always, but don’t be ridiculous about it! I remember all too well how the standardized testing basically forced my students with mild cognitive disabilities and I myself to lie. They’d fly through the test, totally lost, while I told them they did a great job and they told me it was so easy, and that was why they finished so early. I do feel that President Obama has let us down, and that he should be pressured to remove Arne Duncan from office. Thank you, Janet. Congratulations! You sound like you had a wonderful run of it and I know those families are grateful to you. Thank you too for staying involved in these important issues. It sounds like you really understand what’s happening. Sharon, that is unbelievable. It is worrisome to me that they will eventually not have services for students with such serious disabilities. Thank you for your work on these issues. It is needed at this serious time. As an educator and parent of child with specific learning disability I am appalled with the decisions that are being made on every level of government for our students, I have always expected the most from my daughter and from students, but I have seen the frustration and defeat these tests cause. I teach in the high school setting and our state is now requiring all students to take the ACT as part of the graduation requirement. We have also have a graduation project along with other state tests that students are required to take and almost everyone of my students has a huge increase in stress and discouragement tied to these tests. So much rides on them and it can make or break a grade. I would like to know why we, school level personnel, aren’t part of these decisions. Why does it seem that the reform is lead by those whose only experience with education is they attended school? I thank you for the work you are doing and the information that you have provided in keeping us informed with the lunacy of the current lead “educators”. Have you ever thought of running for office? Hi Amelia, The ACT! Well that doesn’t surprise me either. This is really harsh and there is such a push to get everyone on the same page. Seems like the extra projects school start up have more to do with having students look like they are doing something. Thanks! Oh and I don’t think about running for office, but thanks for asking! Nice job Nancy. I have been laying a bit low over the summer but I am glad I caught your take on this. I agree that in some instances we have not challenged or expected enough of our children who have disabilities but I absolutely know testing is not going to help them. I have had many students be successful in their own time and in their own ways- not always measurable on a standardized test. I also have had wonderful students with high functioning Autism- They ace the tests but still have no social skills for working with other people. When we stop being silly and go back to real performance assessments rather than invalid measures, often our students with differences do great. In the meantime I applaud all of you trying to fight for exceptional students. It appears our fearless leaders would rather they all just disappear. Janna! Great insight! I especially appreciate the reference to those who do well on the tests. We see the value of testing, but realize it doesn’t work when it is high-stakes and administered so impersonally. I hope they realize soon the harm that is being done in the name of reform. Thank you for your comment! And enjoy your summer. Reading this post was a welcome breath of fresh air. I have spent ten years working with middle school students with mild to moderate disabilities in a small, high-poverty, rural school, and Duncan’s comments just INFURIATE me. I wish he could have spent the six weeks I did locked in the computer lab with my sped students doing what I was legally allowed to do to encourage and help my sped students on the Oregon Oaks assessment. The agony and frustration that these kids went through–kids who have made enormous leaps in learning through their middle school years, kids who function with mild supports in mainstream classes and thrive on challenges–was excruciating. Especially since afterward, I discovered that the state had previewed Smarter Balance-type questions on the 8th grade test, so it was harder. Those poor kids struggled and gave it their best for two testing rounds. They busted their butts. And they were demoralized when it wasn’t good enough. Some of them soared (primarily 7th grade kids taking a more typical Oaks assessment), but the 8th grade crashed. I’m not going back. This year broke my heart. I’ve seen this coming for the past five years, and I think it will take at least five more years to remediate it. Meanwhile, we’re losing a generation of kids with incredible skills, thanks to the “college and career ready” standards which are really “college ready” standards. Heartbreaking, Joyce. I worry that it is going to get worse as they strive to eliminate services for students with disabilities. Thank you for sharing. Though I am saddened to hear you are leaving teaching, I certainly understand. You are definitely not alone. Take care and stay in touch. Your information is excellent. I have been advocating for my son with Aspergers for many years now and am now working on writing complaints. I think I have realized in the subtleties framed by the lack of collaboration with schools that there is at heart a bigger issue … Thank you for helping me focus on this a bit more fine tuned. The idea that people don’t want to deal with special needs kids is not new, it hasn’t been that long since euthanizing and sterilizing and institutionalization were the norm. Should we be surprised that others want to restrict the support afforded to special needs kids? It is a shame though. The support needed for special needs kids is beneficial for all students. In other words, differentiated education helps all kids grow and is beneficial not just to special needs students but to all students. Further, the true integration and inclusion of special needs children benefits everyone by providing avenues of compassion, empathy, and support for one another … This isn’t tested on standardized tests, how to learn to be nice to others with differences. I really appreciate your writing and will definitely be reporting it! Thank you, Shelly. I always appreciate hearing the views of parents who understand what’s happening and who have a good handle on what schools should be like.